The WV-S3111L 720p Network Dome Camera with Night Vision from Panasonic uses a 1/3" CMOS image sensor to capture 1280 x 720 resolution video at 60 fps. An IR LED provides up to 49' of night vision. The camera's 2.8mm fixed lens delivers a 97° horizontal field of view. Audio pickup is possible thanks to a built-in electret condenser microphone. An onboard memory card slot accepts microSD/SDHC/SHXC cards up to 64GB (available separately). Integrated PoE technology simplifies connectivity by transferring data and power through a single cable. 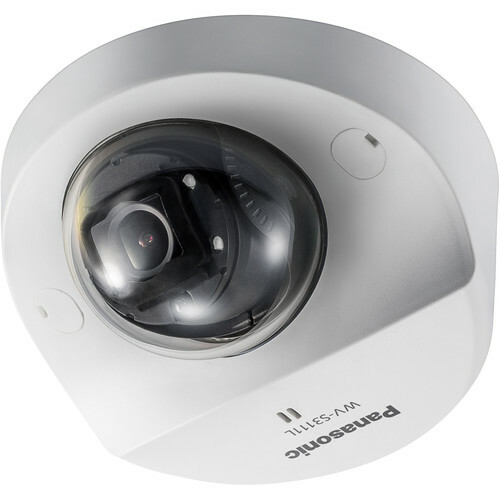 This camera complies with ONVIF profiles S and G, making it compatible with a wide range of surveillance devices. Box Dimensions (LxWxH) 9.05 x 8.95 x 5.0"